Quote..“Life is what happens while you are busy making other plans”…John Lennon, Beautiful boy. I spend my life waiting, as most people do. I waited to grow up, I waited to finish school, I waited to qualify in my profession, I waited to find my partner in life. I waited to have children, I waited for them to grow up, I waited to have grandchildren. and on and on. Always looking forward, enjoying the planning, waiting, waiting. We have spent the last eight months with our lives on hold, living within the day, uncertain of the future, we have been unable to bring ourselves to make plans beyond the next blood test. Now we wait for the results, which will tell us if we CAN make plans,…. and which plans?, dependent on those results…… I’ts ironic. I have tried my best to live within the day, to be aware of every moment, every nuance of the day. To savour each day, and to find something beautiful. The weather, the soft kiss of the breeze, or the sun on my face. Or the misty beauty and colours of the damp autumn. Now in the mornings as the sun rises outside my kitchen window I see the glistening frost on the windows of the cars in the street. Three seasons have gone by, whilst I have sat here with my laptop in the mornings writing my blog. This weekend, while I waited, I decided to stop waiting and I attempted to shake myself out of my lethargy. I took two of my grandsons to a Christmas tree festival and then we went to my house and decorated my tree. 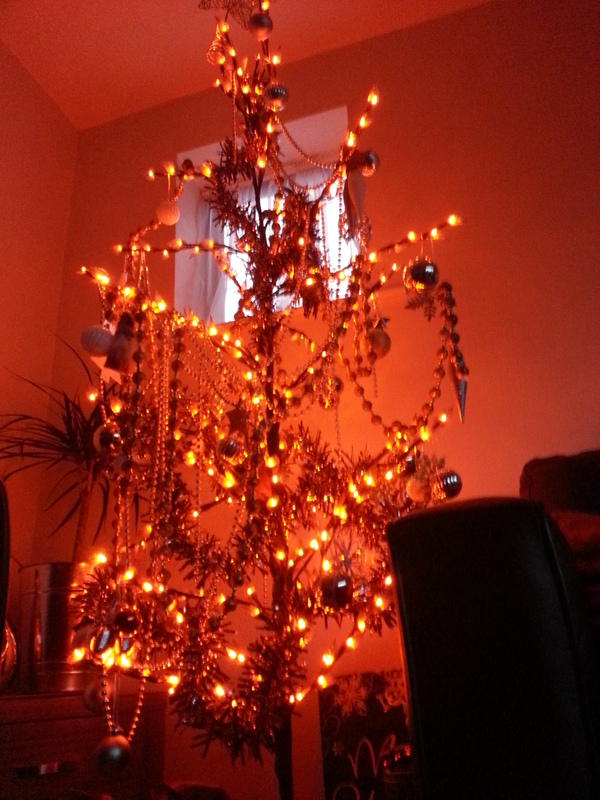 It is a “minimalist tree” which normally only requires just a few quality baubles. This is a leftover from my bah humbug days and was a token gesture to Christmas, which took minimal effort. Since last Christmas, when my husband took me to Paris, suddenly, the commercialism of it all no longer irritated me and I actually appreciated the true meaning of Christmas. Peace and goodwill to all men. Anyway, the boys went to work, hanging not just the few “quality” “tasteful” baubles, but every other bauble they could find, AND tinsel too, AND beads! The stars (two) on top are a bit wobbly, but hey, what the heck? I Love it! and what I have learned?……No it has not been a lesson. Rather my perspective has shifted, almost without me realising it……. Because cancer has a way of focussing the mind. Well “stuff” seems meaningless to me now. The trivial trappings of life, which while entertaining, are not really important anymore. I have learned I am human. I am not as strong and yet stronger than I thought….. Unreasonable anger,… at other people with “trivial” complaints. Bargaining….if only I thought positive, everything would be OK. etc etc..
Depression……I think I hit the wall about 4 weeks ago, when, after juggling, work with hospital visits, admissions, chemo, blood transfusions etc, I found I couldn’t go to work anymore. Acceptance….May be this weekend, the fear has gone and “what will be will be” is the mindset. I have learned I love the man more that I thought it was possible, for such a damaged person as myself. For love is not conditional. it just IS. Well, I have tried. Not always successfully. But whatever the result on Tuesday, we will carry on. Yesterday a police helicopter crashed on a pub in Glasgow. My condolences to the families of the dead. A year ago I was in Glasgow. Tags: cancer, chemotherapy, PET scans, Waiting. Bookmark the permalink. Previous post ← NATIONAL PRIDE?…..
What a beautiful post, Denise! I admire how you are able to “pour yourself out” to us! And I know that you know that we are all waiting with you – praying for good news! Hugs and love to you both! Denise … For whatever reason, our lives have taken parallel paths, and as you had mentioned in your first note to me, you and Michael are ahead of Brenda and I when it comes to dealing with Michael’s illness. In the very short time that I have been following you, and as a new blogger, I have learned much from you when it comes to coping with and dealing with the trials and tribulations of this terrible disease. Thank you for being here, and for being there as well. I am sure that Michael has the best possible medical help he can possibly have, but most importantly, he has you. Be strong … And our blessings are with both of you on Tuesday as well. This is exciting for content search engine optimization loading and displaying technology. If most of the package rate and services which no matter what industry you are given.